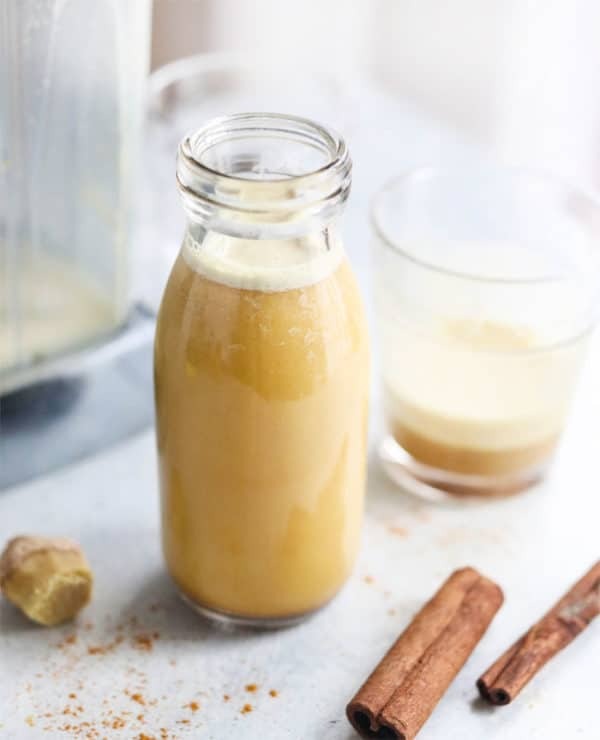 Golden Milk is a comforting dairy-free beverage, made with anti-inflammatory spices like turmeric and ginger. It’s lightly sweetened with honey, and comes together almost instantly in your blender. Turmeric gives this milk its signature “golden” color, and could have powerful anti-inflammatory properties. Thanks to its antioxidant content and active compound curcumin, it may protect against free radical damage and lower the risk of certain brain and heart diseases. Ginger is high in antioxidants, and as a result, it’s thought to have anti-inflammatory properties. It may also help promote healthy blood sugar levels, relieve muscle pain, and ease stomach upset. Cinnamon is also high in antioxidants, and may help to reduce the risk of heart disease. It’s also thought to help prevent insulin resistance (source) and may help to protect against cancer (source). Black Pepper may help to boost digestion and slow down the effects of aging. The compound piperine, responsible for black pepper’s taste may help to aid in the absorption of nutrients, particularly with curcumin, which is found in turmeric. Honey has antibacterial and antifungal properties, and is a good source of antioxidants. It’s also thought to soothe digestive issues and sore throats. Almond Butter is a good source of fiber and monounsaturated fats, which are associated with lowering the risk of heart disease. It also contains vitamin E, which may help to lower cholesterol. Together, these ingredients create a comforting and delicious drink! 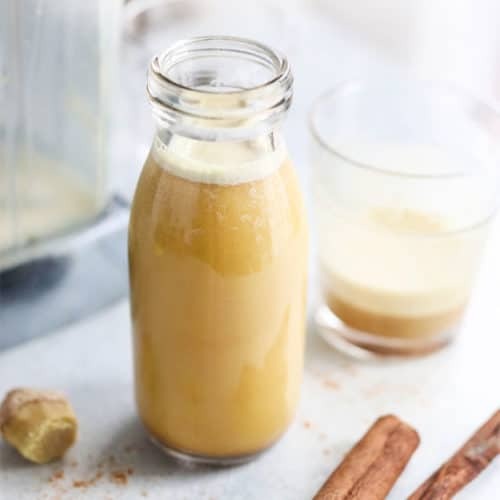 If you haven’t considered turmeric an appealing option before, this quick & easy golden milk recipe may just change your mind. This Golden Milk recipe is as easy as it gets. 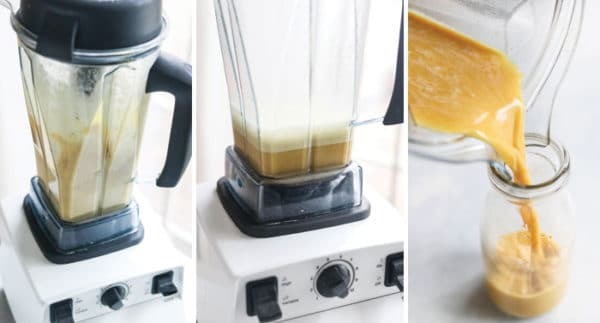 Simply combine the ingredients into a blender, and blend until smooth! You don’t even need to have almond milk on hand, since a spoonful of almond butter will make an “instant” dairy free milk in the blender. You can serve this drink right away, or keep it chilled in the fridge until ready to serve. You can also heat it up on the stove for a warmer drink, but keep in mind that almond milk thickens when heated, so the hot drink will have a thicker texture. There isn’t a specific time of day that is best to drink golden milk. You can use it to replace a morning coffee habit, if you like, or as an afternoon pick-me-up, or as an after-dinner treat that may help ease digestion for an easier night’s sleep. Whenever you drink it, I hope you’ll love this easy recipe! 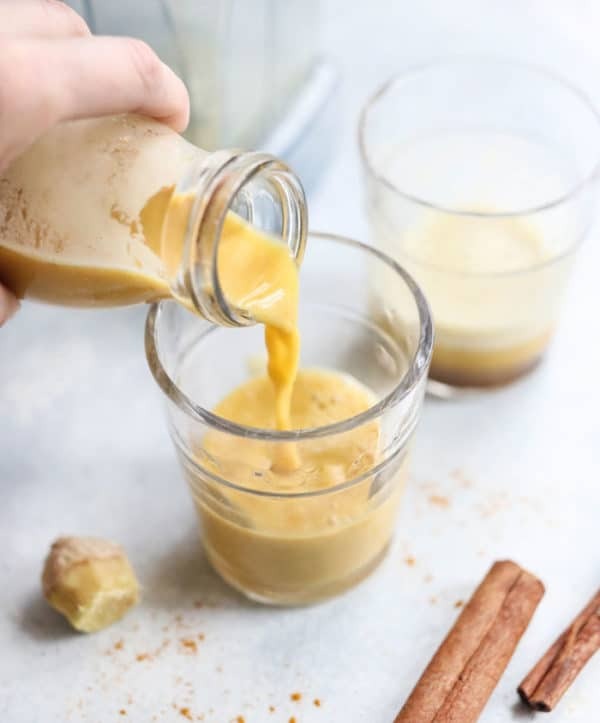 This GOLDEN MILK is made with turmeric, ginger, and black pepper for an anti-inflammatory drink that is dairy-free and naturally sweetened with honey. 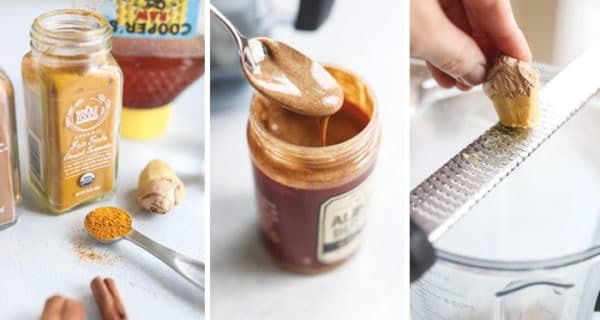 Combine the water, almond butter, turmeric, cinnamon, ginger, black pepper, and raw honey in a blender, then blend until smooth. Taste and adjust the seasonings, then serve right away or store in the fridge until ready to serve. You can gently heat this drink on the stove for a slightly thicker, warm beverage. For a vegan drink, you can replace the honey with 1 to 2 pitted dates instead for sweetness. Maple syrup can also work as a replacement. For a nut-free drink, you can use coconut milk or any other type of milk that you love. Reader Feedback: Have you tried golden milk yet? Thank you for sharing this recipe! 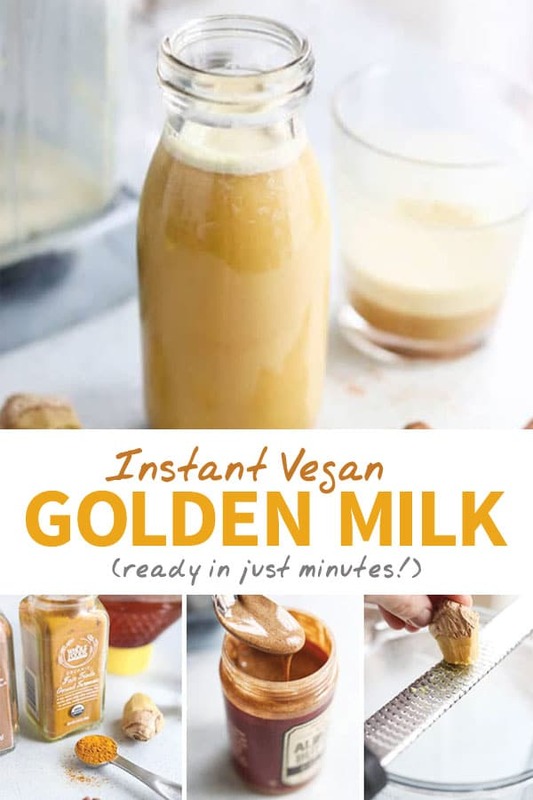 I’ve always wanted to try golden milk, but I don’t live anywhere near a juice bar that would make it. I tried this today and it’s addictive! I don’t normally like turmeric, but I’ve heard such good things about it that I wanted a way to get more in daily. Now I have my solution! I plan to make it again tomorrow, just as written. Thanks! Delicious 😋 love how simple it is to make in the vitamix. I’ve always been afraid yo blend tumeric. Does it stain your Vitamix? That’s what I have and I’d hate for it to be stained. No, it didn’t stain my Vitamix! I would just be weary of white surfaces, like if you had marble countertops, to clean up any spills quickly.